There is very little that will render me speechless. Well – last Sunday was one of those rare occasions. As I walked into the church I found myself overwhelmed with humility and awe. “I am just your servant, Lord,” I prayed. So many came to share this special Installation Liturgy with me – especially on a holiday weekend. What have I done to be deserving of the privilege to be the shepherd of the souls of these wonderful people of St. Pius X? The Lord has done great things for me! I keep saying this – but it is worth repeating until everyone believes and is tired of hearing me say it. 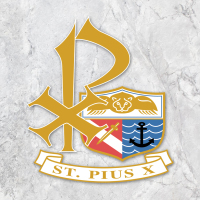 I am overjoyed at being appointed pastor of St. Pius X. I have grown to love this parish and the many people who I have had the privilege to encounter! St. Pius X is blessed with many parishioners willing to give of their time and talents to foster community. Whether it be liturgical, fiscal, educational, or social, I have been overwhelmed with the response of the parishioners to do “whatever is needed” to return our parish to the vital spiritual and social community it can and should be. Well – I am here – for six years or more – and I am here to serve you. Every challenge is an opportunity to change and grow. I am ready and willing to work and pray with all of you. As I stated at Sunday’s liturgy, our God is a God of surprises who encourage us and challenge us to reach beyond. “Let us journey together,” as we seek to build a stronger and more vibrant parish of St. Pius X. A celebration like that we shared last Sunday does not come together without many helping hands. All I did was get up and show up! So who are these helping hands? Too many to list – but let me try. I hope everyone will remember the message I strived to share. We are all created in love. We are all created for love. That love knows no boundaries and doesn’t have any conditions. It should be given to others because it is given to us by our God. My goal is always to bring people together and to help them realize that each creature has the spirit of God in them. Remember that God was working here before I arrived – I am simply his servant. So let us all look for what He has been doing and work together to continue to make a difference in every day. Serve the Lord with gladness!